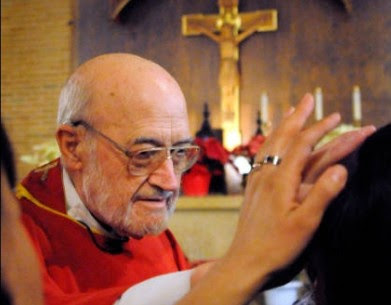 American social justice campaigner, Msgr Marvin Mottet, who was an early member of the US YCS, has died at the age of 86 in Davenport, Iowa, the National Catholic Reporter and Catholic News Service report. Msgr Mottet,a former executive director of the U.S. bishops’ Catholic Campaign for Human Development, had just reached the 60th anniversary of his ordination. In a 2012 interview, he noted that the Great Depression had made a great impact on him as had his experience in YCS. “Well, of course, the Great Depression had a big impact on everybody, just to survive. During those days a lot of Ambrose priests came out of working class families, their dads probably worked in factories and were union organizers and they had that in mind,” he said in an interview with his alma mater, St Ambrose University. “At least in my experience, whatever class I went to I got social justice. If it was Father Urban ‘Penny’ Ruhl in English literature, you got social justice. If it was philosophy, history, it didn’t matter, you got social justice, so it was always woven in there as a thread running through. “Also, there was Young Christian Students that Father Bernard Kamerick led. It had weekly meetings and we would also go to Chicago for big YCS meetings. “As students we got to meet all these priests in Chicago involved in race and justice and inner city issues. And my first year here, Ambrose hosted the National Catholic Social Action Conference. “They called off classes for a day or two and all the students were invited to go. We got to meet all these outstanding people and hear all their talks,” he recalled. Later he often to the Cardijn observe-judge-act methodology that he had learnt, as Katy Strzepek, director of St Ambrose’s Women’s Studies program noted. “I think so, too. I loved it when I heard your talk at the civil rights event, Msgr. Mottet, about Father Joseph Cardijn’s method of observe-judge-act, because that is so much of what I try to teach my students to do in my class,” she told Msgr Mottet in her interview with him. A farm boy from Ottumwa, Iowa, who witnessed his parents’ compassion toward anyone in need, young Marv Mottet honed his social justice skills as a student at St. Ambrose College, and later as a priest and teacher in the Davenport diocese and as executive director of the U.S. bishops’ domestic anti-poverty program, now called the Catholic Campaign for Human Development in Washington, from 1978 to 1985, NCR reports. He embraced diversity, working side by side with African-Americans and with Hispanics to end discriminatory practices in housing, employment and immigration. Ordained to the priesthood at Sacred Heart Cathedral in Davenport in 1956, he helped form the Catholic Interracial Council to address racial discrimination and segregation in the city a year later. At age 78, he marched in a rally in Postville, Iowa, on behalf of immigrants in the country without legal permission who were devastated by a massive immigration raid on the town’s meatpacking plant. He later brought Martin Luther King Jr and Mother Teresa to Davenport to receive the Pacem in Terris Peace and Freedom Award. Years later, he himself received the same award. In 1969, he launched the Social Action Department for the Diocese of Davenport. “A Pacem in Terris Coalition member likened (Msgr Mottet’s influence) to the role of yeast in bread-making. It has an invisible but undeniable effect,” NCR says. Organizations such as Legal Aid, Center for Active Seniors Inc., Quad-Cities Interfaith, Interfaith Housing, Project Renewal, Cafe on Vine and other programs began or benefited from the leavening efforts of Mottet and his collaborators.